Going Nuts is a fun game for Android that involves navigating a cute flying squirrel through dense forests while gathering acorns. Enjoy power-ups, upgrades, exciting 3D graphics, OpenFeint achievements, and much more. As you fly though lush trees, burnt forests, and other landscapes, avoid colliding with trees and be sure to watch out for owls, bad nuts, and TNT tied to balloons. After each flight, see how far you flew and how many acorns you gathered. 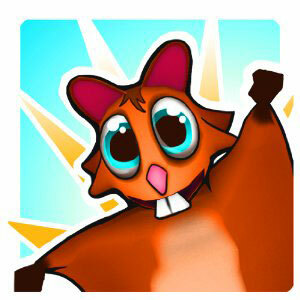 Level up and gain rewards by completing goals like collecting 50 nuts total or flying 1,000 meters in one try. You can also smash through obstacles with helmets or dress up as a classic stunt-person. After you've collected a stash of nuts, you might want to visit the Shop where you can buy power-ups, upgrades, and outfits. Get a Crash Helmet that allows you to survive one collision with a tree, a Magnet that pulls acorns toward you, or a Head Start that gives you a big flying boost. These and other goodies will set you back a few hundred or thousand acorns. If you're in the market for some new duds, you'll be happy to know that the Shop offers an assortment of squirrel outfits, from Stuntman and Hot Rod to Skeleton and Flower Power. You can also check out your stats to find out how many acorns you grabbed, your longest flight, and the details of all your deaths. If you feel like flying all out, look into the various fun achievements available, including collecting 1,000 frozen nuts to achieve the Winter Coat, hitting 10 owls for the Avian Flu, and flying 200 meters without collecting a single nut to earn the Allergic to Nuts achievement. Show off with OpenFeint leaderboards and have fun Going Nuts!